China is developing a medium- to long-range strategic bomber said to be developed entirely on its own. However, the bomber’s design is based Russian TU16 and Tu160. As China is now developing large airliner jointly with Russia, it is possible that China can get some help from Russia as there is a Chinese-Russian alliance against the US now. There is not much information about the bomber so far. It is only known that to make it undetectable, it carries its weapons inside and China is now able to use revolving missile launch pods for its missiles as such pods have already been used on China’s WU-10 attack helicopters. The US depends on its nuclear weapons and air force to maintain its world hegemony. Helping China surpass the US in strategic nuclear weapons and air force will put an end to the hegemony. It means a lot for Russia who is under the pressure of US sanctions. After all, the bombers will solely be used as strategic nuclear weapons against the US They are no threats to Russia as neither Russia nor China wants to fight a nuclear war between them. The US, however, will certainly use its nuclear weapons against China if it has lost a conventional war with China but is still superior in nuclear weapons. On the other hand, if there are military conflicts between Russia and China, what Russia shall worry is China’s large army equipped with increasingly advanced weapons instead of air force. That is why Russia is willing to sell China its most advanced Su-35 fighter jets and S300 air defense system. Just as this blogger said in his previous posts, Chinese-Russian cooperation in weapon development add wings to two tigers. 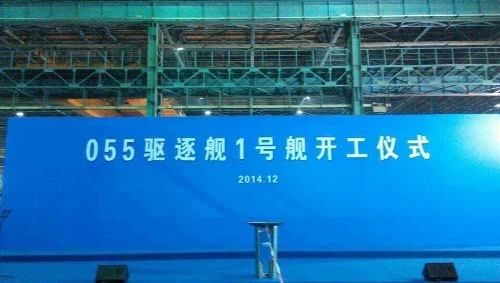 According to huanqiu.com, a picture of the ceremony on the commencement of the construction of Type 055 destroyer in December was posted on a well-known military forum. However, it is unknown whether it is true. However as some tests on the ground of the structure of the destroyer have been carried out recently, the picture is now a hot media topic. According to foreign media reports and relevant information, Type 055’s over 10,000 ton displacement enables it to carry two helicopters and 96 vertical launch units. It is a rival to the improved version of US Arleigh Burke class destroyer in terms of stealth, defense, fire power and other functions and performance. The Louvre Museum has 8.5 million visitors per year. This blog was viewed about 430,000 times in 2014. If it were an exhibit at the Louvre Museum, it would take about 18 days for that many people to see it. In my post “Canada, China to sign deal on return of fugitives’ seized assets” on December 17, I said, “Only when those who have become rich through corruption cannot retain their assets abroad can China’s anti-corruption storm be really effective. According to Reuters, China and Canada are to sign a deal on recovering the assets such corrupt criminals have moved to Canada. Canada, Australia and the United States are the top destinations of immigration and transfer of ill-gotten assets for Chinese corrupt officials and criminals. If China can bring back those criminals to justice and recover their stolen assets, it will complete the awe it has created among them and greatly damp their desire to make such illegal gain. China is looking at signing an agreement with the United States to target assets illegally taken out of China by corrupt officials, a state-run newspaper said on Monday, as the government tightens the screws in its anti-graft battle. China has vowed to pursue a search, dubbed Operation “Fox Hunt,” beyond its borders for corrupt officials and business executives, and their assets. But Western countries have balked at extradition deals with China, partly out of concern about the integrity of its judicial system and treatment of prisoners. Rights groups say authorities use torture, and the death penalty is common in corruption cases. The China Daily said the central People’s Bank of China was talking to the U.S. Treasury Department’s Financial Crimes Enforcement Network (FinCEN) about an agreement targeting ill-gotten assets in the United States. U.S. State Department spokesman Jeff Rathke said at a press briefing Monday that no agreement was under consideration, but pointed to existing agreements that touched on recovering criminal assets. “There’s no additional agreement… currently being considered,” Rathke said. Chinese state media reported earlier in December that Beijing is set to finalize such a deal with Canada. The central bank was also looking at a deal with Australia, the China Daily said, citing Zhang Xiaoming, deputy head of the Finance Ministry’s legal assistance and foreign affairs department. “After the agreements are made, China will share intelligence with the U.S. and Australia, which will also offer information to their enforcement agencies to conduct further investigations,” Zhang told the English-language paper. Last year FinCEN signed what it described as an “unprecedented” agreement with Mexican authorities to share information that could help combat money laundering to terrorist financing, focused on international criminal groups in the U.S. and Mexico. While FinCEN receives and analyzes suspicious financial transaction data, and can share that data with others, it does not have the ability to freeze funds. A representative of the Justice Department, which would need to seek a court order to freeze or seize assets, said U.S. and Chinese officials had discussed the issue of recovering assets earlier in December. The representative declined to provide further details. Chinese President Xi Jinping waits for leaders to arrive before the opening ceremony in the Expo Center at the fourth Conference on Interaction and Confidence Building Measures in Asia (CICA) summit in Shanghai, in this May 21, 2014 file photo. People outside China usually regard China’s ideological control as originated from communism. That is entirely a misunderstanding. Since Emperor Wudi (157BC to 87BC) of the Han Dynasty decided to adopt Confucianism as the dominant ideology, China had imposed strict Confucianist ideological control until the 1911 democratic revolution. The only difference now is that the Chinese Communist Party (CCP) wants to impose Marxist ideological control. Chinese President Xi Jinping has called for greater “ideological guidance” in China’s universities and urged the study of Marxism, state media reported on Monday, as the country tightens control on Western ideology. 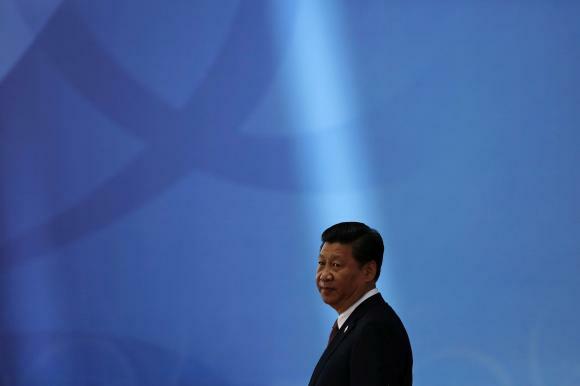 Xi’s comments are the latest sign of his politically conservative agenda and come amid a ratcheting up of controls over the media, dissidents and the internet. China’s Communist Party has signaled that it will not embark on political reform, despite hopes that Xi, the son of a former liberal-minded vice premier, may loosen up. Xi said universities had to “shoulder the burden of learning and researching the dissemination of Marxism”, Xinhua state news agency said. Xi called on the authorities to step up the party’s “leadership and guidance” in universities as well as to “strengthen and improve the ideological and political work”. The campuses should “cultivate and practice the core values of socialism in their teaching”, Xi said. Curricula and speech at Chinese universities are tightly controlled by the government, though students have at times pushed the limits, including during the 1989 Tiananmen Square pro-democracy protests that were brutally suppressed by the army. An influential party journal said in September that one of China’s top universities, Peking University, had urged students and teachers to “fight” criticism of the party. Last year, a liberal Chinese economist who had been an outspoken critic of the party was expelled from Peking University after he called for democratic reforms. Xi has espoused old school Maoism as he seeks to court powerful conservative elements in the party. Like many officials before him, Xi is steeped in the party’s long-held belief that loosening control too quickly, or even at all, could lead to chaos and the break up of the country. Xi’s administration has overseen a crackdown on dissidents and on freedom of expression that many rights activists say is the most sustained and severe in years. Last week, Chinese media reported that a university in northwestern China had banned Christmas, calling it a “kitsch” foreign celebration unbefitting of the country’s own traditions and made students watch propaganda films instead. US supply of 4 Perry class frigates to Taiwan has become a hot topic, but a PLA major says that even with such weapons, Taiwan lags behind China by 2 decades. Especially, Perry class frigates are outdated warships that the US is decommissioning and selling to get some funds to ease the effect of the reduction in US military budget. However, even if the US is willing to sell Taiwan some really advanced weapons, it takes time for Taiwan to learn how to operate them and provide logistic services for them; therefore, the US is unable to help Taiwan if a war breaks out now. Over the past decade, PLA has commissioned lots of advanced weapons and set up a combat system much superior to Taiwan’s. The war now be of such a large scale that Taiwan cannot afford. If the war across the strait emerges in the future, China is enhancing its military strength much faster than Taiwan. Taiwan will be hopeless especially when China has commissioned its J-20 stealth fighter jets and hypersonic weapons and built its homegrown aircraft carrier. According to the major, China wants a peaceful solution of the Taiwan issue. For that purpose, China has to develop its military to make it far more superior to Taiwan’s. The US knows well that it is unable to help Taiwan but only wants to make money by selling some outdated weapons to Taiwan. Taiwan knows well such weapons cannot help, but at least the sales show that the US is on its side. That gives Taiwan a sense of security. China is to publish online details of legal religious venues, the official Xinhua news agency reported on Saturday, apparently in an effort to identify unsanctioned groups as part of an effort to “root out illegal religious activities”. Names and addresses for “all Buddhist and Taoist venues” would be published within two years, Wang Zuoan, director of the State Administration for Religious Affairs, told a conference on Friday, according to the news agency. Xinhua made no mention of other religions but it quoted Wang as saying the information would help stop illegal religious activity in unauthorized locations. Anti-cult messages are prolific on message boards in some city neighborhoods, and suspicion can extend to established religions. The government describes resistance to its rule in Muslim and Tibetan Buddhist communities as inspired by outside forces trying to dismember China, and defends its religious policy as suitable for “reasonable practitioners”.